The earliest Instructions Manual for the Model 21. This version, probably the most common, did not have a form number. This manual was shipped with guns made after WWII, mine is still sealed in the original celophane wrapper with catalog number #1926 ©1948. I believe it to be one of the more common manuals. The Winchester Corporate and Divisional name on the manual was in effect from December 30, 1944 to January, 1952. I've never opened mine but I believe the interior is identical to the second post-war manual, but without the RED print on the cover and in the interior. See the following manual. This Instructions Manual, was shipped with guns made during the later production era. 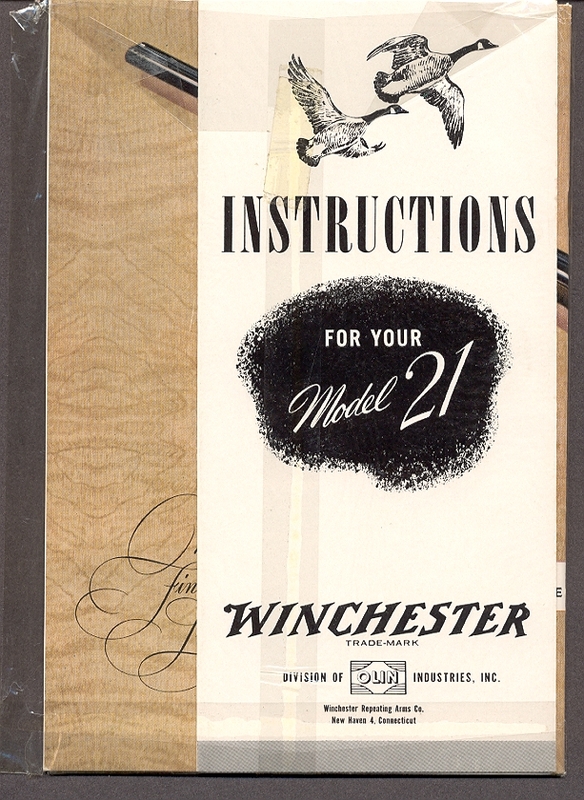 The Winchester Corporate and Divisional name on the manual was in effect from January, 1952 to August, 31, 1954. Again, no form number. An instruction manual from the Custom Shop era. Form number 4F011 dates the manual from 1964. All of the photos are 'upgraded', featuring a Custom grade Model 21. Also this is the only instruction manual to feature a 'Specifications' page from the current catalog. The final instruction manual from Winchester. Form number 4049-4 dates the manual from 1974. This is the only manual or catalog to feature an exploded parts nomenclature and drawing. Note the gun featured in the parts drawing is a Custom grade.